Here, we describe settings to monitor in parallel circadian bioluminescence and the secretory activity of human islet cells and primary myotubes. For this, we employed lentiviral gene delivery of a luciferase core clock reporter, followed by in vitro synchronization and collection of outflow medium by continuous cell perifusion. Petrenko, V., Saini, C., Perrin, L., Dibner, C. Parallel Measurement of Circadian Clock Gene Expression and Hormone Secretion in Human Primary Cell Cultures. J. Vis. Exp. (117), e54673, doi:10.3791/54673 (2016). Circadian clocks are functional in all light-sensitive organisms, allowing for an adaptation to the external world by anticipating daily environmental changes. Considerable progress in our understanding of the tight connection between the circadian clock and most aspects of physiology has been made in the field over the last decade. However, unraveling the molecular basis that underlies the function of the circadian oscillator in humans stays of highest technical challenge. Here, we provide a detailed description of an experimental approach for long-term (2-5 days) bioluminescence recording and outflow medium collection in cultured human primary cells. For this purpose, we have transduced primary cells with a lentiviral luciferase reporter that is under control of a core clock gene promoter, which allows for the parallel assessment of hormone secretion and circadian bioluminescence. Furthermore, we describe the conditions for disrupting the circadian clock in primary human cells by transfecting siRNA targeting CLOCK. Our results on the circadian regulation of insulin secretion by human pancreatic islets, and myokine secretion by human skeletal muscle cells, are presented here to illustrate the application of this methodology. These settings can be used to study the molecular makeup of human peripheral clocks and to analyze their functional impact on primary cells under physiological or pathophysiological conditions. The circadian timing system (from Latin "Circa diem") has emerged in all light-sensitive organisms, as an adaptive mechanism to the rotation of the Earth. In mammals, it is organized in a hierarchical manner, encompassing the central clock, which is situated in the suprachiasmatic nucleus of the ventral hypothalamus, and peripheral (or slave) oscillators that are operative in different organs. Moreover, these cell autonomous self-sustained oscillators are functional in nearly every cell of the body 1. Photic signals represent a dominant synchronizing cue (Zeitgeber) for the SCN neurons, whereas neural and humoral signals emanating from the SCN reset the peripheral clocks. In addition rest-activity rhythms, that drive in turn feeding-fasting cycles, are further synchronizers for peripheral clocks 2. According to our current understanding, the molecular makeup of the core clock is based on transcriptional and translational feedback loops, which are conserved between organisms. This comprises the transcriptional activators BMAL1 and CLOCK, which together activate transcription of the negative core clock PER and CRY genes. High levels of PER and CRY proteins will inhibit their own transcription through inhibition of the BMAL1/CLOCK complex. An auxiliary loop consists of the nuclear receptors REV-ERBs and RORs, which also regulate the transcription of BMAL1 and CLOCK. Furthermore, posttranslational events including phosphorylation, sumoylation, acetylation, O-GlcNAcylation, degradation and nuclear entry of the core clock proteins represent an additional important regulatory layer in establishing the 24 hr oscillation cycle 3. Accumulating evidence stems from studies in rodent models and highlights the critical role of the circadian system in the coordination of metabolic and endocrine functions 4-5. A number of large-scale transcriptome analysis suggest that feeding – fasting cycles play a central role in the synchronization of peripheral oscillators 6-8. In an agreement with these studies, metabolomic and lipidomic analysis in rodents and humans have revealed that a large number of metabolites oscillate in tissue, plasma, and saliva in a circadian manner 9-11. Importantly, most hormones exhibit circadian rhythms in blood 5,12-13. Moreover, circadian clocks of the corresponding hormone producing peripheral tissue might regulate hormone secretion locally. Cell-autonomous circadian oscillators have been described in rodent and human pancreatic islet cells 14-16. These oscillators play an essential role in regulating the pancreatic islet transcriptome and function 15,17-18. Furthermore, myokine secretion by human skeletal myotubes has been recently demonstrated to exhibit a circadian pattern, which is regulated by cell-autonomous oscillators operative in these cells 19. Several approaches for studying circadian rhythms in humans in vivo have been widely used. For instance, plasma melatonin or cortisol levels as well as thoracic skin surface temperature (reviewed in references 3,20) have been studied to assess endogenous circadian clocks. Although these methods allow studying systemic circadian oscillations in vivo, they are far from providing a reliable assessment of free-running autonomous circadian rhythms in different organs and tissues. Nevertheless, such dissection from the systemic regulation would be an indispensable tool for understanding the specific effect of intracellular molecular clocks on the function of these cells. Therefore, a substantial effort has been undertaken to develop reliable approaches for studying human clocks in immortalized or primary cultured cells synchronized in vitro. Importantly, it has been demonstrated that clock characteristics measured in cultured primary skin fibroblast cells closely reflect the individual clock properties of the whole organism 21. The development of fluorescent and bioluminescent circadian reporters has greatly advanced this approach 22-27. Furthermore, studying primary cell clocks that are derived from different peripheral organs allows for the investigation of the molecular properties of human tissue-specific clocks 3,5,16,19-20,28. Thus, assessment of circadian clocks in in vitro synchronized primary explants or cells, by using bioluminescent reporters, represents a highly useful method to study the molecular makeup of human peripheral clocks and their impact on organ function. In this article, we will present detailed protocols for assessing circadian gene expression in human primary islet and skeletal muscle cells synchronized in vitro as well as the impact of autonomous cellular clock disruption on the secretory function of these cells. Ethics statement: Manipulations included in this protocol were approved by the Ethics Committee of the Geneva University Hospital and by the Ethical Committee SUD EST IV (Agreement 12/111) 19. Human islets were isolated from pancreases of brain-dead multi-organ donors in the Islet Transplantation Centre at the University Hospital of Geneva (Switzerland) as described by us in references 16,18, or obtained from a commercial source. NOTE: Coat every tube, plastic tip or pipette with Connaught Medical Research Laboratories (CMRL) medium in order to prevent islets or islet cells from sticking to the plastic surface, which can lead to a significant loss of cell material. One day prior to islet cell dissociation add 1 ml of laminin-5-rich extracellular matrix (derived from 804G cells as described in reference 29) per 3.5 cm dish. Before plating cells, aspirate the matrix and wash the dish 3 times with sterile bi-distillated water. Allow the dish to dry under the laminar flow cabinet for 5 min. Inside the laminar flow cabinet, distribute the obtained islets with CMRL medium into 15 ml tube(s). Centrifuge at 272 x g for 5 min. Aspirate the supernatant, and then resuspend the pellet in 1 ml of sterile Dulbecco's phosphate-buffered saline (DPBS) pre-warmed to 37 °C without calcium and magnesium. Centrifuge at 272 x g for 5 min. Aspirate the supernatant and resuspend the cell pellet in 1 ml of DPBS. To count the total number of islets, pipet 10 µl from the 1 ml islet suspension into a new 3.5 cm dish. Count the number of islets in the 10 µl drop under the microscope and from this calculate the total number of islets in the 1 ml islet suspension. Add 14 ml of DPBS and centrifuge the cell suspension one more time at 272 x g for 5 min. For islet cell dissociation, aspirate the supernatant and add 1 ml of cell detachment solution for a maximum of 1,000 islet equivalents (IEQ). Place the tube in a water bath at 37 °C and gently mix the islets by pipetting up and down several times every minute, during 6-10 min. NOTE: To check the digestion quality, pipet a 2 µl drop of suspension on a glass slide and check under the microscope that all cells are well separated, and that no doublets or cell clumps have remained. Stop the reaction by adding 14 ml of cold CMRL with supplements (10% fetal bovine serum (FBS), 1% of L-alanyl-L-glutamine dipeptide, 1% penicillin-streptomycin (P/S), 1% gentamycin, 1% sodium pyruvate). Centrifuge at 425 x g for 5 min. Aspirate the supernatant and add 15 ml of CMRL medium to the cell pellet. Resuspend the pellet in a small volume of CMRL with supplements. Count the number of cells under the microscope using a hemocytometer, adjust the CMRL volume in order to obtain a cell concentration of ~650, 000 cells/ml. Pipet 3 separated drops of 100 µl each from the dispersed cell suspension obtained in step 1.1.8 in a 3.5 cm dish pre-coated with laminin. NOTE: Cells attach to the dish in about 24 hr. Incubate cells (Figure 1A) in a tissue culture incubator at 37 °C in a humid chamber. Change the medium of the cell drops every 2-3 days by aspirating 100 µl from each drop and replacing it with the same volume of fresh medium. Note: Muscle biopsies were obtained from the group of Etienne Lefai (INSERM, Lyon, France) 19. Purify primary skeletal myoblasts according to the previously described procedure 30. Take one vial (1 x 106 cells) of human myoblasts stored in liquid nitrogen and thaw cells quickly by putting the vial for 30 sec to 1 min in a water bath at 37 °C with agitation. Pipet cells (1 ml) into 24 ml of growth medium composed of HAM F-10 supplemented with 20% FBS, 1% P/S, 0.5% gentamycin and 0.2% amphotericin B. Centrifuge 5 min at 150 x g.
Remove the supernatant and resuspend cells with 15 ml of fresh growth medium per 2.5 x 105 cells. Plate at least 2.5 x 105 cells per F75 adherent flask. Keep the myoblasts in a cell incubator at 37 °C and 5% CO2. Once cells reach 60-80% confluency, dissociate cells with trypsin-EDTA 0.05% for 1-2 min and plate them in 2 ml of growth medium on adherent 3.5 cm petri dishes. After reaching confluence, remove the growth medium. Start the differentiation protocol of human myoblasts into myotubes by culturing them in 2 ml of Dulbecco's Modified Eagle Medium (DMEM) containing 1 g/L of glucose, 2% FBS, 1% P/S, 0.5% gentamycin and 0.2% amphotericin B (differentiation medium) in a cell incubator at 37 °C and 5% CO2. Change the medium every 2 to 3 days. NOTE: Myotubes are usually formed within 7-10 days. Check muscle cell differentiation under the microscope (Figure 2A) by observing the fusion of myoblasts into polynucleated myotubes 19. NOTE: The transfection protocol is performed in drops of 100 µl on the next day after cell dissociation (steps 1.1.1-1.1.10). Aspirate 100 µl of CMRL medium from each drop and replace it with the same volume of serum-free Minimal Essential Medium (MEM) 2 hr before transfection by pipetting. Prepare a MEM-based mix of transfection reagent and 50 nM of target siRNA (siClock) or 50 nM of non-targeting siControl according to the manufacturer's instructions. For one dish with 3 drops prepare two 1.5 ml tubes with 200 µl of MEM each. Add to one of these tubes 4 µl of transfection reagent. Add to the second tube 1 µl of the of appropriate siRNA stock solution (20 µM). Agitate these two tubes slowly on the orbital shaker for 5 min and then mix the content of the tubes together and agitate for 20 more min. Aspirate 100 µl of MEM from each drop and replace it with the same volume of transfection mix obtained in the previous step by pipetting. Replace the transfection solution with CMRL medium after 4 hr of incubation at 37 °C. Repeat steps 2.1.1-2.1.3 the following day for cell re-transfection. Before transfection, replace the medium (see step 1.2.2.8) with 2 ml of fresh differentiation medium per 3.5 cm petri dish. In a sterile 1.5 ml tube, prepare a mix of 20 nM siRNA (siControl or siClock), which corresponds to 2.4 µl of a 20 µM siRNA solution, and 12 µl of transfection reagent diluted in 100 µl of differentiation medium. Incubate the solution at room temperature for 15 min with gentle agitation. Transfect cells with 114.4 µl of the siRNA mix per 3.5 cm petri dish and place cells into a tissue culture incubator at 37 °C and 5% CO2 for 24 hr. NOTE: All procedures with lentiviral particles must be performed in a biosafety level 2 facility to take additional precautions for work with agents that pose a moderate potential hazard to personnel and the environment. Prepare reporter lentiviral particles by co-transfecting the vector of interest pLenti6.4/R4R2/V5-DEST/Bmal1-luc or pLV156-Per2-dLuc (called Bmal1-luc and Per2-luc, respectively,) plasmid 31 with lentiviral vectors pMD2G and psPAX into 293T cells using the polyethylenimine method (for detailed procedure see reference 16). Titrate the obtained lentiviral particles (details on the titration can be obtained at http://lentilab.unige.ch/). For further experiments, use lentiviruses with titers ranging 104 to 105 transducing units [TU/µl]. Place dishes with human islet cells or human myoblasts (at 30-50% confluency) inside the laminar flow cabinet and replace the medium with 2 ml of fresh supplemented CMRL medium (see step 1.1.7) or growth medium (see step 1.2.2.2), respectively. Calculate the multiplicity of infection (MOI) (i.e. infectious particles (transducing units)/number of cells). Transduce the primary cell culture by pipetting lentivirus solution to the dish in order to obtain a MOI = 3 (for example, for 65,000 attached cells add 3 µl of the virus solution with the titer of 6.5 x 104 to 100 µl medium drop). Incubate overnight in a tissue culture incubator. Change medium the next day. NOTE: Transduce human islet cells at least 4 days prior to bioluminescence recording in order to achieve sufficient expression of the reporter construct. Myoblasts are transduced during the expansion phase, then grown to confluence, and subsequently differentiated into myotubes. Add 10 µM of adenylyl cyclase activator in 2 ml of medium per 3.5 cm petri dish containing the primary cells previously transduced in step 3.1.5. Incubate for 60 min at 37 °C in a cell culture incubator. Change the medium containing the adenylyl cyclase activator with 2.5 ml of the recording medium containing 100 µM luciferin. NOTE: For human islet cells use CMRL supplemented with 10% FBS, 1% L-alanyl-L-glutamine dipeptide, 1% P/S, 1% gentamycin; for human myotubes use phenol red - free DMEM with 1 g/L glucose supplemented with 2% FBS, 2% L-alanyl-L-glutamine dipeptide, 1% P/S, 0.5% gentamycin and 0.2% amphotericin B. Setting Up Long-term Constant Perifusion and Bioluminescence Recording for Human Primary Cells. NOTE: When working outside the laminar flow cabinet, clean all contact surfaces and limit exposure of cultures or medium to the air to avoid contamination. To prepare the perifusion medium, add 100 µM of luciferin to the medium. NOTE: For human islet cells use CMRL supplemented with 10% FBS, 1% L-alanyl-L-glutamine dipeptide, 1% P/S, 1% gentamycin; for human myotubes use phenol red – free DMEM with 1 g/L glucose supplemented with 2% FBS, 2% L-alanyl-L-glutamine dipeptide, 1% P/S, 0.5% gentamycin and 0.2% amphotericin B. Inside the laminar flow cabinet, open the 3.5 cm dishes containing the transduced, transfected and synchronized primary cell cultures (islet cells or myotubes) as described above. Insert sterile metallic caps (developed in house) (Figure 1B2) into the 3.5 cm dishes that are equipped with silicone influx/efflux connecting tubes (Figure 1B1/B5). Place the dishes on the measurement platform in the 37 °C light-tight incubator. Fix the dishes to the platform by using a screwable adaptor (Figure 1B3). Insert the influx/efflux tubes of the perifusion system into the appropriate silicone tubes of the cap (Figure 1B1/B5) and set the speed of the pump at a flow rate of ~0.5 ml of medium per 1 hr. Open the in-house developed Drip-biolumicorder software that records the signals from the photomultiplier tube (PMT) detector. Chose the directory where the data will be stored and start continuous bioluminescence recording from each dish by clicking the "start" icon. NOTE: Alternatively to the Drip-biolumicorder software, other programs (e.g. LumiCycle), can be used to record signals from PMT detector. Place sterile 6-well tissue culture plates in the collection box on ice. Open the control software that controls the timing of the automated switch among the collection wells. Set up the time window of medium collection (sec). Start collection of the outflow medium every 4 hr (14,400 sec; ~2 ml per time-point) by clicking the "run" icon. Transfer and measure the outflow medium from each collection well into sterile 2 ml tubes by pipetting. Keep tubes in a -20 °C freezer before starting the next step. Repeat steps 4.1.5-4.1.6 every 24 hr. Stop the bioluminescence recording and the medium flow by clicking the "stop" icon on the corresponding software. Remove the metallic caps and aspirate the residual medium from the dishes. In order to normalize the secreted protein values obtained in different experiments, either extract DNA (normalization by genomic DNA content for myotubes 19), or add 1 ml of lysis acid-ethanol buffer (normalization by total hormone content for islet cells 18) to the dishes. Quantify basal insulin levels in the outflow medium from collected time-points by using a human insulin enzyme-linked immunosorbent assay (ELISA) kit following the manufacturer's instructions. Normalize data to the absolute volume of collected medium in each well and to the total insulin content, extracted from acid-ethanol treated cells at the end of the experiment (step 4.1.9) 18. Quantify basal IL-6 levels in the outflow medium from collected time-points by using a human IL-6 ELISA kit following the manufacturer's instructions. Normalize data to the absolute volume of collected medium in each well and to genomic DNA content at the end of the experiment (step 4.1.9). Analyze bioluminescence profile using the provided software 19. Analyze hormone secretion profiles and bioluminescence recording results by using the JTK_CYCLE algorithm 32. Set the circadian period width at 20-24 hr. NOTE: In case the experimental conditions were recorded in parallel, a paired statistical analysis can be performed to compare the experiments. Alternatively, analyze hormone secretion and circadian bioluminescence profiles using the CosinorJ software 28. After providing a first molecular characterization of the circadian clock, operative in human islet cells 16, we aimed at studying the impact of clock disruption on islet function and transcription 18. We set up an efficient siClock transfection protocol in dispersed human islet cells (see Protocol for details), which resulted in more than 80% knockdown of CLOCK mRNA, and in efficient clock ablation as measured by circadian bioluminescence profiling 18. Glucose induced insulin secretion (GSIS) analysis revealed significantly reduced basal and stimulated insulin secretion upon such clock disruption (not shown). To assess hormone secretion by human islet cells around-the-clock, a continuous perifusion system was connected to a luminometer (depicted in Figure 1B). Human islet cells, bearing a functional (siControl) or dysfunctional (siClock) oscillator were transduced with Bmal1-luc lentiviral particles. Cells were subsequently synchronized with a pulse of adenylyl cyclase activator followed by parallel analysis of circadian bioluminescence and insulin secretion into the outflow medium during 48 hr (Figure 1C, D 18). 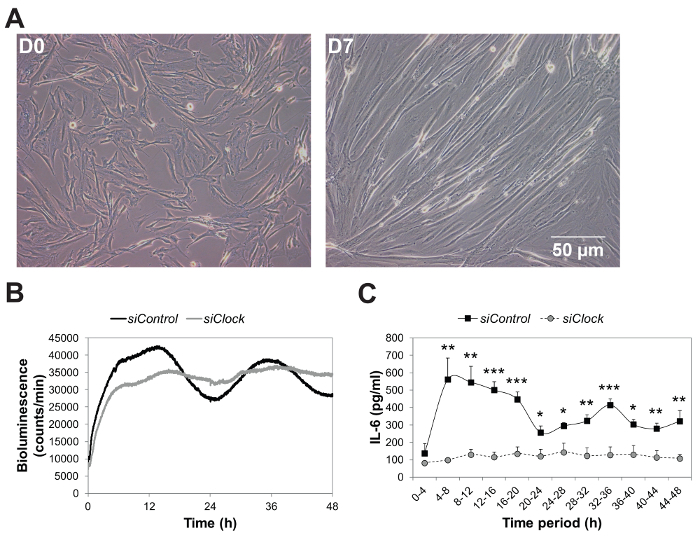 These experiments suggest that under constant physiological glucose concentration (5.6 mM glucose), insulin secretion by in vitro synchronized human islet cells exhibits a circadian profile, which is disrupted in siClock bearing samples (Figure 1D). In view of the potential role of the skeletal muscle clock in the regulation of glucose metabolism in rodents 33, we aimed at characterizing circadian rhythms in primary human skeletal myotubes and at investigating their role in myotube function 19. To this end, disruption of the circadian clock in skeletal myotubes was achieved by transfecting siRNA targeting CLOCK. Circadian bioluminescence reporter assays with Bmal1-luc and Per2-luc reporters revealed that human skeletal myotubes, synchronized in vitro, exhibit a self-sustained circadian rhythm, which was further confirmed by endogenous core clock transcript expression (Figure 2B; 19). This endogenous clock was efficiently disrupted in the presence of siRNA targeting CLOCK (Figure 2B). Moreover, the basal secretion of IL-6 (Figure 2C), interleukin-8 (IL-8) and Monocyte Chemotactic Protein 1 (MCP-1) (not shown) by synchronized skeletal myotubes, assessed by the here described perifusion system (Figure 1B) and subsequent large-scale myokine multiplex analysis (not shown), exhibits a circadian profile, which is strongly dysregulated upon clock disruption (Figure 2C 19). Figure 1: Assessment of Hormone Secretion with Parallel Circadian Bioluminescence Recording from Perifused Human Islet Cells. (A) Representative picture of attached human islet cells one day after islet dissociation. (B) Schematic presentation of the home-made perifusion system that includes a bottle with the perifusion medium, a pump, a measurement platform equipped with a photomultiplier tube (PMT) within the light-tight incubator, a luminometer device, controlled by the recording software, and a semiautomatic sample collector. Insert: (B1) Influx connecting tube; (B2) metallic cap for the 3.5 cm Petri dish; (B3) screwable adaptor that attaches the cap to the measurement platform (B4); (B5) efflux connecting tube; (B6) automatically controlled medium distributor. (C) Human islet cells were transfected with either scrambled siRNA (siControl) or siRNA targeting CLOCK (siClock) and transduced with the Bmal1-luc reporter. Cells were constantly perifused with culture medium containing 5.6 mM glucose. Circadian bioluminescence was recorded following synchronization by an adenylyl cyclase activator pulse. (D) Insulin levels were assessed by ELISA in the outflow samples collected every 4 hr during 48 hr. Application of JTK_CYCLE algorithm 32 confirmed that in the presence of a functional clock (siControl), the average profile of secreted insulin was circadian within 48 hr, with a period length of 24.19 ± 0.89 hr (**p = 0.009; n = 7 donors). This circadian profile was lost upon clock disruption (siClock). Data are presented as % of secreted hormone from the total hormone content (mean ± SEM) for n = 7 donors (one replicate for each donor).This figure has been modified from reference 18. Please click here to view a larger version of this figure. Figure 2: Basal IL-6 Secretion by Human Skeletal Myotubes is Strongly Inhibited in the Absence of a Functional Circadian Clock. Myoblasts were transduced with lentiviral particles containing the Bmal1-luc transgene, differentiated into myotubes, and transfected with either siControl or siClock siRNA. 24 hr following transfection, myotubes were synchronized with an adenylyl cyclase activator pulse and subjected to continuous perifusion with parallel bioluminescence recording. (A) Representative pictures were taken at day 0 (D0) and D7 following the switch from 20% to 2% FBS containing medium to induce myotubes differentiation. During the differentiation process, human myoblasts are reoriented, become elongated and fuse together to form a plurinuclated syncytium. (B) Bmal1-luc bioluminescence profiles of siControl-transfected myotubes (black line) and siClock-transfected myotubes (grey line). Bmal1-luc oscillation profiles were recorded in three independent experiments (one donor per experiment). (C) Representative basal IL-6 secretion profile in the presence or absence of a functional clock. The perifusion outflow medium was collected in 4 hr intervals during 48 hr (0-4 corresponds to the accumulation of IL-6 between 0 hr and 4 hr). IL-6 levels in the medium were assessed by ELISA in two technical duplicates from three independent experiments. The results represent basal IL-6 levels normalized to the total DNA content. IL-6 secretion was reduced on average of 69.30 ± 10.61% upon circadian clock disruption (mean ± SEM, n = 3; *p <0.05, paired t test). This figure has been modified from reference 19. Please click here to view a larger version of this figure. The experimental settings described here are composed of lentiviral delivery of circadian bioluminescence reporters into cultured human primary cells, followed by subsequent in vitro synchronization and continuous recording of bioluminescence for several days, and parallel analysis of hormone secretion by the same cells. They represent an efficient approach for exploring molecular mechanisms and functional aspects of circadian clocks in human primary cells. The quality of the donor material is an important issue for the preparation of viable primary tissue cultures. The quality of human islets should be evaluated each time before starting the experiment. Islets with estimated purity or/and viability inferior to 70% are not recommended for these experiments. Islet cells tend to re-establish contacts in dissociated cultures, which plays an important role in their survival and function. Since islet cells do not proliferate in culture, they must be plated at a high density, which allows cells to establish contacts with neighboring cells. This is achieved by plating cells in droplets of a small volume. Importantly, cell death is higher in low-density islet cell cultures. Note that medium replacement should be performed promptly in order to avoid cell drying. Myoblasts should be passaged preferably at 60% confluence, since a higher density may induce myoblast differentiation. After trypsinization, myoblasts should be carefully resuspended and dispersed to avoid cell clusters. Bacterial or fungal contamination of primary cells should be excluded microscopically before starting the perifusion assay. Culture medium might be supplemented with antifungal substances. Additionally, the perifusion tubing should be rinsed by alcohol iodine disinfection/sterile water and the metallic caps should be sterilized by autoclaving. These steps are recommended between each experiment. For efficient bioluminescence recording, the quality of the reporter lentivirus preparation should be determined by the intensity of the bioluminescent signal. The details of lentivirus production including troubleshooting can be found at http://lentilab.unige.ch/. Prior to plasmid transfection for lentivirus production, 293T cells should be plated at 30-50% confluence. It is highly recommended to perform a control of the transfection efficiency in a parallel dish, for instance by using CMV-GFP or an alternative fluorescent lentivector. For each virus preparation the virus titer should be established. As the described experiments are typically long-lasting (48 hr or more), it is crucial to have stable silencing during this time span. The concentration of siRNA should be optimized as well as the cell confluency according to the siRNA reagent protocol. Efficiency of gene silencing must be tested at the end of the experiment by RT-qPCR or by Western blotting. During perifusion, the flow rate determines the time necessary to completely exchange the medium in the dish but also has a mechanical impact on the primary cell culture. Indeed, setting up the flow at a rate, which is too low, will not allow for a complete exchange of medium in the dish, and will decrease the sensitivity of the method. On the contrary, a high-speed flow rate may damage the cells. In our hands, the optimal speed for both cell types did allow to collect 0.5 ml of the outflow medium per 1 hr. Importantly, to obtain a measurable concentration of substances in the outflow medium, a sufficient number of secreting cells should be present in the perifused dish. The follow up method for the detection of the secreted substance (ELISA or other) should be sensitive enough, especially for substances secreted in very low concentrations. Higher cell density might be recommended to overcome this problem when possible. Alternatively, the outflow medium can be concentrated by dialysis or with centrifugal filters, as described by us in details in reference 19. Taken together our experiments in human pancreatic islet cells and in primary myotubes provide for the first time compelling evidence that these human cells possess high-amplitude cell-autonomous circadian clocks 18-19. Employing the here described perifusion system combined with a luminometer device (Figure 1B) we have demonstrated that these clocks play an important role in the circadian regulation of basal insulin secretion by pancreatic islet cells (Figure 1D), and of basal IL6 secretion by skeletal myotubes (Figure 2C). Moreover, by knocking down the core clock gene CLOCK in both experimental systems, we show that a functional circadian oscillator is required for proper rhythmic insulin and IL-6 secretion by human islet and skeletal muscle cells, respectively (Figures 1C, D and 2B, C). Our results indicate a critical role of the human islet clock for proper insulin secretion, and are in good agreement with works performed in rodent genetic models 15,17. Given the major role of the circadian clock in allowing organisms to anticipate daily environmental changes rather than to react to them, circadian regulation of basal insulin and myokine secretion might represent such an anticipatory mechanism that coordinates pancreatic islet and skeletal muscle secretory activities to the rest-activity cycle of the whole body. The here proposed methodology can be easily modified in order to study additional hormone secretion from the same tissues. We have already analyzed an additional large panel of myokines secreted by skeletal muscle cells, using multiplex human myokine arrays 19, and we are in the process of assessing glucagon secretion by human islet cells using the Glucagon ELISA kit (data not shown). Moreover, these experimental conditions can be optimized for other cell types, for instance primary adipocytes, for studying adipokine secretion, primary thyrocytes for studying thyroid hormone secretion, primary enterocytes for studying incretins secretion, etc. An additional important application of this system could be to explore the impact of physiological and/or pharmacological compounds on cellular circadian clock function and secretion. The compound of interest might be applied continuously throughout the entire experiment (for instance studying insulin secretion by human islet cells in the presence of high glucose or different levels of free fatty acids), or the compound might be added at a chosen phase of the circadian cycle. This technique has the limitations of an in vitro study and does not represent the complexity of circadian rhythm regulation on a whole body level. At the same time, it helps to distinguish the role of an autonomous clock on cellular metabolism under controlled conditions. Currently available methods are based on snapshot measurements of secretion activity in the cells or explants following in vitro synchronization 17. The protocol described here represents a unique method allowing a concordant and continuous analysis of circadian rhythm and secretory activity within the same cell culture. Alternatively, this methodology could be applied to study the kinetics of non-circadian bioluminescent reporters, in conjunction with cell secretion, as well as for detecting the effects of different substances added to the perifusion medium on cell function. The critical steps in the protocol are: 1) efficient lentivirus preparation, 2) efficient cell transfection with siRNA and reporter vectors transduction; 3) constant medium outflow collection and 4) making sure that a sufficient number of cells is used in order to obtain measurable levels of hormones or cytokines in the collected outflow medium (see the troubleshooting above). In view of recent evidences on the link between circadian clock perturbations and metabolic diseases and cancer in humans 3-4,28,34-35, studying human peripheral clock properties in primary cultures may represent an important and unique approach for understanding the potential clock connection to these diseases. Thus, our discovery of the existence of links between functional human pancreatic islet and skeletal muscle clock and basal secretion of insulin and myokines, might bear potential consequences for the understanding of the development of chronic diseases, such as obesity and type 2 diabetes 18-19 and will bring new avenues in the treatment of these diseases. Importantly, due to the established correlation between the in vitro assessed oscillator characteristics and the in vivo circadian phenotype 36, implication of human circadian clock properties as a hallmark of diseases, is of highest and immediate clinical relevance 20. We are grateful to our colleagues from the University of Geneva: Jacques Philippe for constructive comments on this work, Ueli Schibler for invaluable help with the development of the perifusion system and for scientific inspiration, André Liani for the having conceived design, manufacturing and commissioning of the perfusion system, Lesa-Technology LTD company for the assistance in the perifusion system and Drip-biolumicorder software development, George Severi for assistance with the perifusion experiments, Ursula Loizides-Mangold for critically reading the manuscript, and Anne-Marie Makhlouf for lentivirus preparations; to Etienne Lefai, Stéphanie Chanon and Hubert Vidal (INSERM, Lyon) for preparing human primary myoblasts; and to Domenico Bosco and Thierry Berney (Human Islet Transplantation Center, Geneva University Hospital) for providing human islets. This work was funded by the Swiss National Science Foundation Grant No. 31003A_146475/1, the Sinergia Swiss National Science Foundation Grant No. CRSII3-154405, Fondation Romande pour la Recherche sur Diabète, Bo Hjelt Foundation, Fondation Ernst et Lucie Schmidheiny, and Société Académique de Genève (CD). Albrecht, U. Timing to perfection: the biology of central and peripheral circadian clocks. Neuron. 74, (2), 246-260 (2012). Dibner, C., Schibler, U., Albrecht, U. The mammalian circadian timing system: organization and coordination of central and peripheral clocks. Annu Rev Physiol. 72, 517-549 (2010). Dibner, C., Schibler, U. Circadian timing of metabolism in animal models and humans. J Intern Med. (2015). Marcheva, B., et al. Circadian clocks and metabolism. Handb Exp Pharmacol. (217), 127-155 (2013). Philippe, J., Dibner, C. Thyroid circadian timing: roles in physiology and thyroid malignancies. J Biol Rhythms. 30, (2), 76-83 (2015). Andrews, J. L., et al. CLOCK and BMAL1 regulate MyoD and are necessary for maintenance of skeletal muscle phenotype and function. Proc Natl Acad Sci U S A. 107, (44), 19090-19095 (2010). McCarthy, J. J., et al. Identification of the circadian transcriptome in adult mouse skeletal muscle. Physiol Genomics. 31, (1), 86-95 (2007). Shostak, A., Husse, J., Oster, H. Circadian regulation of adipose function. Adipocyte. 2, (4), 201-206 (2013). Dallmann, R., Viola, A. U., Tarokh, L., Cajochen, C., Brown, S. A. The human circadian metabolome. Proc Natl Acad Sci U S A. 109, (7), 2625-2629 (2012). Adamovich, Y., et al. Circadian clocks and feeding time regulate the oscillations and levels of hepatic triglycerides. Cell Metab. 19, (2), 319-330 (2014). Chua, E. C., et al. Extensive diversity in circadian regulation of plasma lipids and evidence for different circadian metabolic phenotypes in humans. Proc Natl Acad Sci U S A. 110, (35), 14468-14473 (2013). Kalsbeek, A., Fliers, E. Daily regulation of hormone profiles. Handb Exp Pharmacol. (217), 185-226 (2013). Hastings, M., O'Neill, J. S., Maywood, E. S. Circadian clocks: regulators of endocrine and metabolic rhythms. J Endocrinol. 195, (2), 187-198 (2007). Muhlbauer, E., Wolgast, S., Finckh, U., Peschke, D., Peschke, E. Indication of circadian oscillations in the rat pancreas. FEBS Lett. 564, (1-2), 91-96 (2004). Marcheva, B., et al. Disruption of the clock components CLOCK and BMAL1 leads to hypoinsulinaemia and diabetes. Nature. 466, (7306), 627-631 (2010). Pulimeno, P., et al. 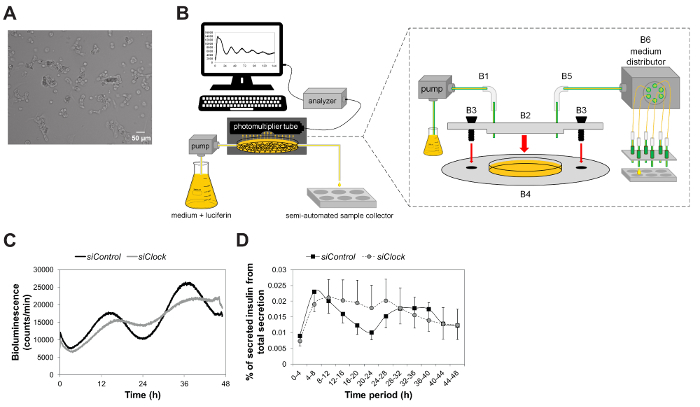 Autonomous and self-sustained circadian oscillators displayed in human islet cells. Diabetologia. 56, (3), 497-507 (2013). Perelis, M., et al. Pancreatic beta cell enhancers regulate rhythmic transcription of genes controlling insulin secretion. Science. 350, (6261), (2015). Saini, C., et al. A functional circadian clock is required for proper insulin secretion by human pancreatic islet cells. Diabetes Obes Metab. (2015). Perrin, L., et al. Human skeletal myotubes display a cell-autonomous circadian clock implicated in basal myokine secretion. Mol Metab. 4, (11), 834-845 (2015). Saini, C., Brown, S. A., Dibner, C. Human peripheral clocks: applications for studying circadian phenotypes in physiology and pathophysiology. Front Neurol. 6, 95 (2015). Brown, S. A., et al. Molecular insights into human daily behavior. Proc Natl Acad Sci U S A. 105, (5), 1602-1607 (2008). Asher, G., et al. SIRT1 regulates circadian clock gene expression through PER2 deacetylation. Cell. 134, (2), 317-328 (2008). Dibner, C. On the robustness of mammalian circadian oscillators. Cell Cycle. 8, (5), 681-682 (2009). Dibner, C., et al. Circadian gene expression is resilient to large fluctuations in overall transcription rates. EMBO J. 28, (2), 123-134 (2009). Nagoshi, E., et al. Circadian gene expression in individual fibroblasts: cell-autonomous and self-sustained oscillators pass time to daughter cells. Cell. 119, (5), 693-705 (2004). Sage, D., Unser, M., Salmon, P., Dibner, C. A software solution for recording circadian oscillator features in time-lapse live cell microscopy. Cell Div. 5, (2010). Kowalska, E., Moriggi, E., Bauer, C., Dibner, C., Brown, S. A. The circadian clock starts ticking at a developmentally early stage. J Biol Rhythms. 25, (6), 442-449 (2010). Mannic, T., et al. Circadian clock characteristics are altered in human thyroid malignant nodules. J Clin Endocrinol Metab. 98, (11), 4446-4456 (2013). Parnaud, G., et al. Proliferation of sorted human and rat beta cells. Diabetologia. 51, (1), 91-100 (2008). Agley, C. C., Rowlerson, A. M., Velloso, C. P., Lazarus, N. L., Harridge, S. D. Isolation and quantitative immunocytochemical characterization of primary myogenic cells and fibroblasts from human skeletal muscle. J Vis Exp. (95), e52049 (2015). Liu, A. C., et al. Redundant function of REV-ERBalpha and beta and non-essential role for Bmal1 cycling in transcriptional regulation of intracellular circadian rhythms. PLoS Genet. 4, (2), e1000023 (2008). Hughes, M. E., Hogenesch, J. B., Kornacker, K. JTK_CYCLE: an efficient nonparametric algorithm for detecting rhythmic components in genome-scale data sets. J Biol Rhythms. 25, (5), 372-380 (2010). Dyar, K. A., et al. Muscle insulin sensitivity and glucose metabolism are controlled by the intrinsic muscle clock. Mol Metab. 3, (1), 29-41 (2014). Innominato, P. F., et al. The circadian timing system in clinical oncology. Ann Med. 46, (4), 191-207 (2014). Chitikova, Z., et al. Identification of new biomarkers for human papillary thyroid carcinoma employing NanoString analysis. Oncotarget. 6, (13), 10978-10993 (2015). Pagani, L., et al. The physiological period length of the human circadian clock in vivo is directly proportional to period in human fibroblasts. PLoS One. 5, (10), e13376 (2010).